Read the rest of my posts about our Iceland road trip here. 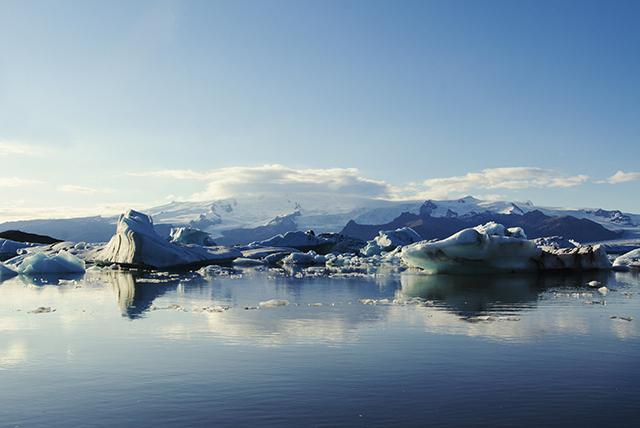 After our brief nighttime view of Jökulsárlón, we were a little worried we might see the lagoon with zero icebergs. However, our day dedicated to it was just as wonderful as I'd hoped it would be. 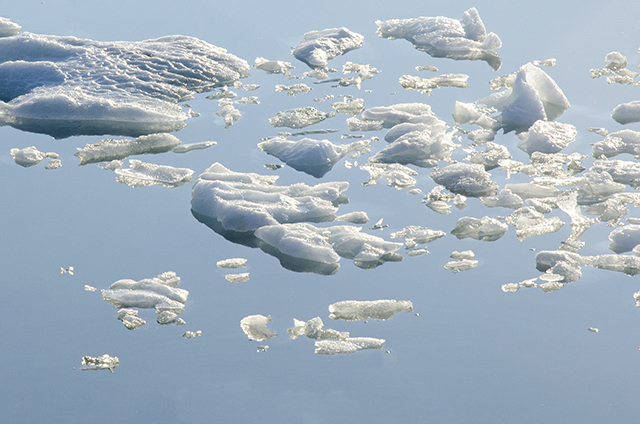 Overnight a new crop of icebergs had appeared, and there were even a couple of seals bobbing around in the water. 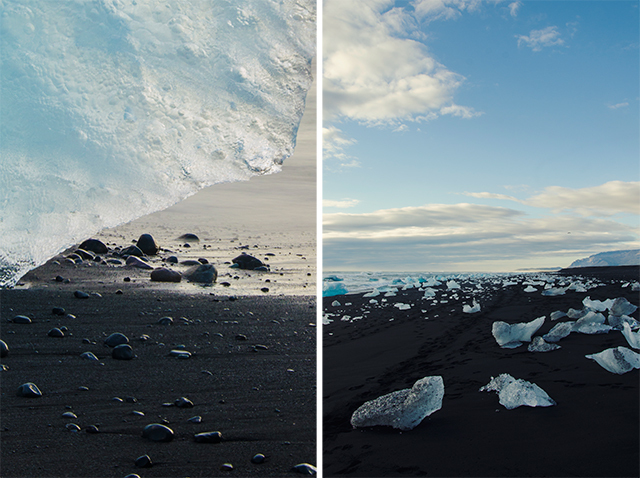 We spent the morning on the beach in front of the lagoon, known for good reason as 'Diamond Beach'; smaller icebergs float down from the lake into the sea, which breaks them up and deposits the large chunks left all over the black sand. Five or six people stood at intervals along the beach, trying to capture the glistening shards of blue and white ice. 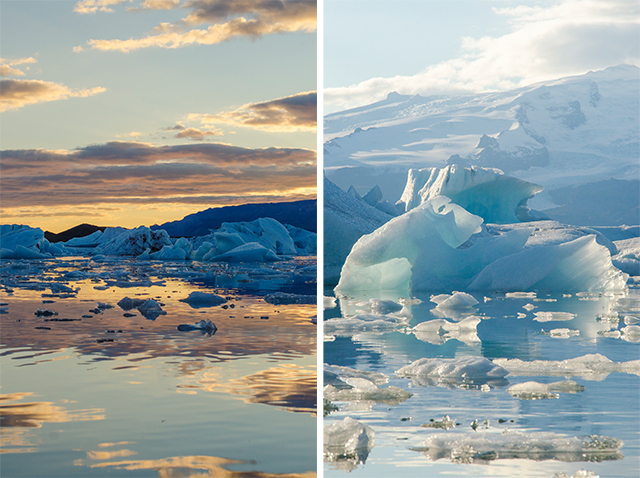 After we'd spent a couple of hours wandering around the beach, sitting on icebergs and generally enjoying the quiet view, we made our way back over to the lagoon to admire the icebergs and listen to the slow cracking of new icebergs calving from the glacier. We had planned on doing more driving, but we decided to stay on at the lake for a slow day instead. Some intrepid surfers appeared, playing music from their car and with surfboards strapped to the roof. They swam in the freezing water, yelling to each other and climbing onto the smaller icebergs to launch themselves off, laughing. It looked like fun, but shivering on the beach in five layers, I wasn't entirely jealous. As the sun went down, the lagoon changed through blues to golds to dusky pinks, and we sat on the black sand until nearly all the light had died away before heading back to the guesthouse. That evening we joined a couple we'd met, tucking into cured arctic char and rúgbrauð (rye bread), and steaming bowls of kjötsúpa (a traditional lamb soup). 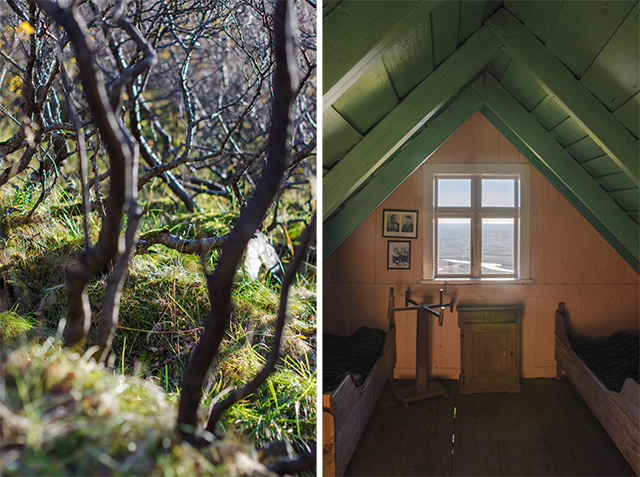 The following morning, we got up early, eating skyr, toast and tea whilst looking over our maps. We joined  and  on their trip to Skaftafell, a beautiful preservation area in the Vatnajökull National Park. 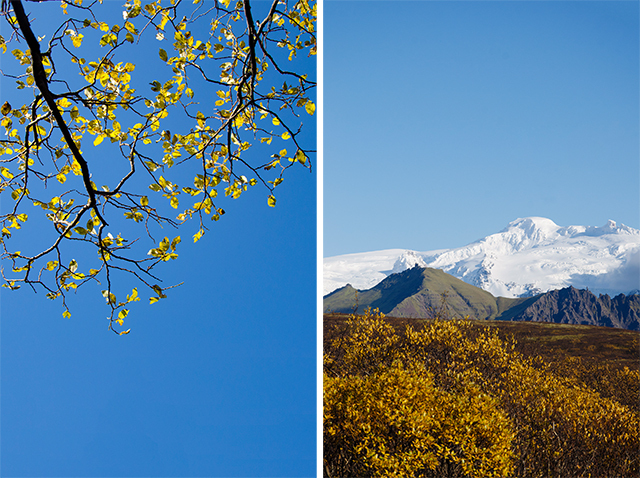 After some decidedly wintry days, pulling up to Skaftafell was like turning back the seasons to the best of sunny Autumn. The trees were covered in a blanket of bright yellow and orange leaves, the sky was a perfect blue, and little rock ptarmigans pecked at the grasses. 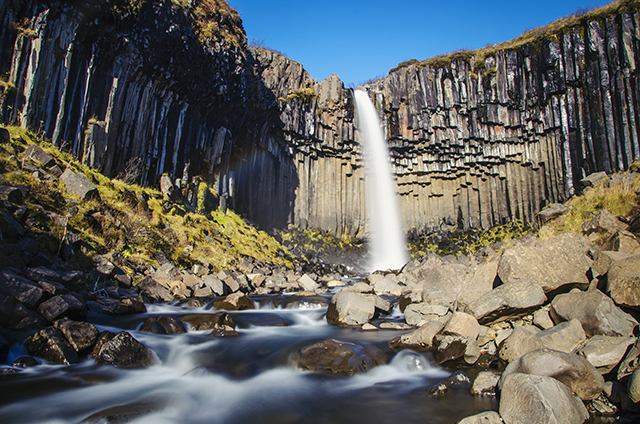 As we made the short hike to Svartifoss we found ourselves stripping off our usual thick layers. The waterfall was spectacular, and we sat for hours in the sunshine in our t-shirts, eating cereal bars and trying to capture the rainbows appearing in the spray at the foot of the waterfall's columns. We hiked back via a different route, stopping off at the viewpoint at Sjonarsker for a panoramic view; then down to the old farmhouses at Sel, looking across Skeiðarársandur's kilometres of black sand straight to the sea. The little turf-roofed houses were abandoned in 1946, and are now frozen in time - little wooden beds with woollen blankets, original furniture and old farm equipment. 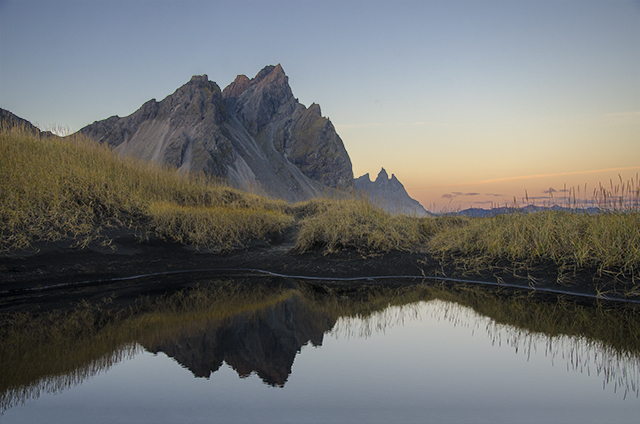 Back at the car, we decided to push on to try and reach Stokksnes and Vestrahorn for sunset. We arrived just as the sun had set behind the mountain and sat in the dunes among the grasses, listening to the sea. The perfect finish to the evening was hearing the sound of hooves, and turning to see a local riding an Icelandic horse at tölt along the track, framed against the sun. We drove the few miles into Höfn and grabbed a hot dog and a few hours sleep before our pre-dawn start to catch Vesturhorn again at sunrise.